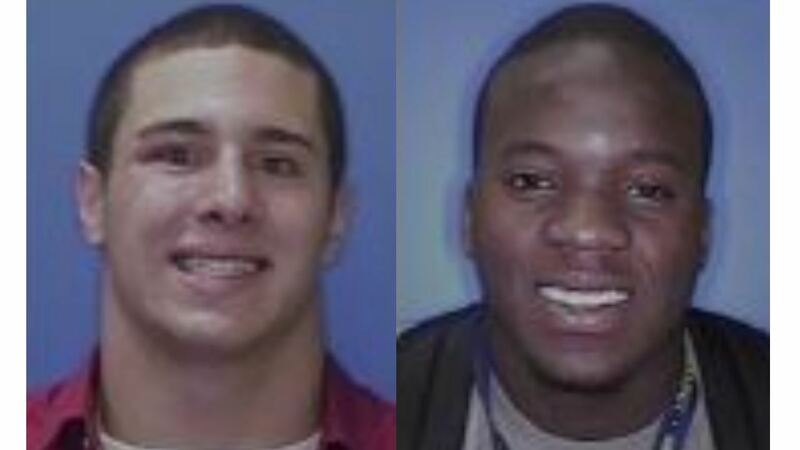 ROCHESTER, N.Y. -- Two University of Rochester football players from Illinois were rescued after they were kidnapped and held hostage in New York, police said. University police sent out a statewide alert over the weekend that seniors Ani Okeke Ewo, of Aurora, Ill., and Nicholas Kollias, of Northbrook, Ill., had been missing since 2 a.m. Saturday. The students were subsequently found. Investigators said at a news conference the pair were kidnapped and held against their will. A SWAT team rescued the students just before 9:30 p.m. Sunday. Both were taken to the hospital, where one is recovering from a gunshot wound. Police said he was shot in the leg before the rescue operation began and is expected to recover. "The is a collective sense of relief tonight, that all of us feel. This could have turned out in a very different way," University of Rochester President Joel Seligan said. There are two students with the same names listed on the University of Rochester Yellowjackets football page. According to the website, Kollias plays defensive end and attended Glenbrook North High School. Contrary to police reports, the site said Ewo is from Romeoville and attended high school there. He plays cornerback. Four people were taken into custody. Authorities said the students were targeted and there is no reason for other students at the university to be worried. Investigators are looking into why Kollias and Ewo were targeted. Kidnapping and assault charges are expected. Detectives said the investigation is ongoing.